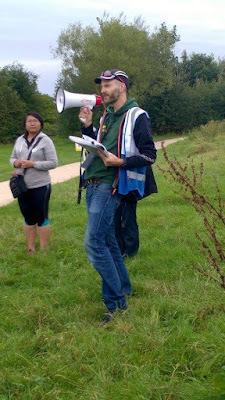 For the last couple of months, I've been planning a special day at my local parkrun to celebrate and to encourage visually impaired runners. We're lucky enough to have a couple of regular VI runners at Colwick, and Terry - who introduced me to guiding - has now done well over 100 parkruns with us and has been guided around the course by more than 30 different guides. Accessibility is one of the core principles of parkrun: it's open to everyone and is completely free; it doesn't matter if it takes you 15 minutes to get round the 5km course, or it takes you over an hour... everyone is welcome. We wanted to try and extend this to people with visual impairments. Running has never been more popular: more and more people are getting up and out on 'couch to 5k' programmes and the like. At parkrun, we reckon that people with visual impairments are just the same, with the crucial difference that they have a much more obvious barrier to participation: they can't see and likely need some help to get involved. So, part of the idea of a VI parkrun day was to try to encourage participation amongst the VI community and to show them how accessible parkrun is and how easy it is to come along and to walk, run, jog or volunteer. Just as importantly though, this was an opportunity to drive awareness of the barriers facing visually impaired people amongst a community at parkrun who have already shown they're keen to get involved by sticking their hands up to volunteer as guides. So I spent some time over the last few months trying to engage with both our community of parkrunners, our local network of VI runners and guides and some of the local VI charities....and the big day was last Saturday. It took a bit of time to get everything together, but in the end, I think it was worthwhile. You can read the full story in the run report here. Two weeks ago, there were 16 recorded blind runners at parkruns across the whole UK....which doesn't feel like all that many to me, to be honest. At our VI parkrun, we had 3 blind runners and eight sighted runners who bravely ran around the course blindfolded with a guide. I was maybe hoping for more, but one of the key things I've learned along the way is that, if we're serious about engaging visually impaired people, then we need to work harder with the charities to reach out into the VI community - many of whom have plenty of other things to worry about than running. The blind runners we did reach were already runners and already parkrunners; blind people who aren't runners aren't generally able to just get up and head off to a strange park for a run... for starters, they need transport and they need guides. I'm sure they're out there, but if we want to reach them, we're going to have to work harder to get them to the starting line. Still, I'm pleased to have been involved and I think it went pretty well. The next one will be better.